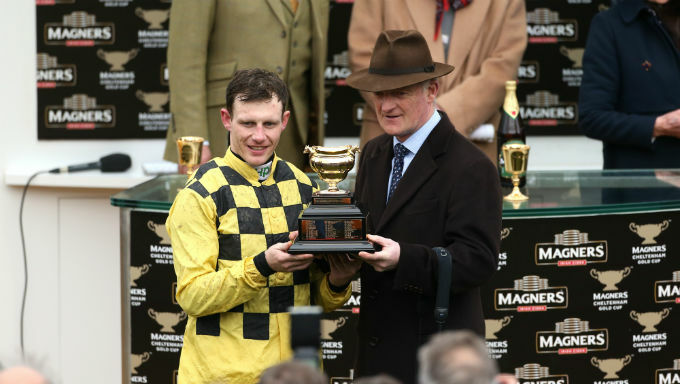 Ireland's champion trainer Willie Mullins finally landed his first Cheltenham Gold Cup win on Friday as Al Boum Photo powered to victory in the feature race of the Festival. Mullins saddled four runners in a bid to break his duck, after seven second placings during his illustrious career, but by half-way in the 3m2f test, he had only one chance left. Kemboy fell at the first, then Invitation Only followed suit, with Bellshill pulling up before the second circuit. Al Boum Photo was travelling comfortably behind last year's first and second Might Bite and Native River at the time, but there was still a long way to race. ✋ RT if you backed it! Jockey Paul Townend showed grit and patience to produce the 12/1 shot at the right moment, driving him up the hill to win by two and a half lengths over the Tony Martin-trained Anibale Fly. He said: "Willie has supported me throughout my whole career and I'm delighted to be able to give this to him. To be the one who rode his first Gold Cup winner." Bristol De Mai finished third for Nigel Twiston-Davies, ahead of last year's Gold Cup winner Native River and the King George VI Chase hero Clan Des Obeaux. The 100/30 favourite Presenting Percy never travelled with great fluency, making jumping errors before sticking on for eighth position. Victory in the Albert Bartlett Novices' Hurdle earned Minella Indo a quote of 10/1 for the 2020 Stayers' Hurdle with bookmakers Unibet. The 50/1 shot, the second such winner to score at this festival, was a welcome relief for trainer Henry De Bromhead, who had seen well-fancied Monalee finish only fourth in Thursday's Ryanair Chase. He said: "I'm delighted to get this win for these guys. We've been trying to get one for a few years, although Monalee ran well yesterday, we were a bit flat afterwards. "It's amazing to come back with this guy. We always liked him and Rachael [Blackmore] thought he'd improve for his run at Clonmel. He just dragged her around for three miles. It was brilliant. Minella Indo's owner Barry Maloney is an old university friend of De Bromheads, and said: "We bought the horse two years ago - he was a point-to-pointer who won a race and was then bought by Henry De Bromead. "This is our first winner at the festival and it's unbelievable, the best feeling in the world." Having gotten her first Festival win on A Plus Tard in the Novices' Handicap Chase on Tuesday, this was a second for jockey Rachael Blackmore, who said: "I am so grateful to everyone for giving me the opportunity to ride him. I wish I had the words to describe it - riding a Grade 1 winner at Cheltenham is just beyond belief." Pentland Hills's 20/1 upset in the Triumph Hurdle, set up a Cheltenham after-party that could well have 3,000 hosts. The Nicky Henderson-trained winner is owned by a syndicate, Owners Group 031, that is made up of 3,000 members, 10s of them making it to Cheltenham on Gold Cup day to see there horse win his second hurdle race. Henderson said: "When he went to Plumpton (and won), I was very impressed with him because he was so professional - he raced professionally and jumped very well. There is a huge great team in this group of owners, it's sort of an off-shoot of Elite Racing Club, and I said we might as well have a day out because I think he knows enough to risk doing it." Pentland Hills over came a bad mistake at the first hurdle to win by three lengths over Chris Jones's Irish raider Couer Sublime, also a 20/1 shot in the betting, and Gardens Of Babylon. The run impressed jockey Nico De Boinville, already successful this week on the mighty Altior in the Champion Chase. He said: "This is only his second start over hurdles and he must be some horse. He knows exactly what he's doing and settles well, which is nice. I would like to hope that he could be a Champion Hurdle horse. We didn't know what he had before today." He added: "He's owned by thousands of people, so it is going to be some party afterwards I think." The victory was marred by the death of the 11/10 favourite Sir Erec, who was put down having suffered an irreparable injury during the race.